If you are out at a restaurant and looking for to impress your fellow diners then the ‘Glass Through Table Trick‘ is a great magic trick to learn and have stored in your memory bank. The Glass Through Table Trick is not just restricted to being performed at a restaurant. 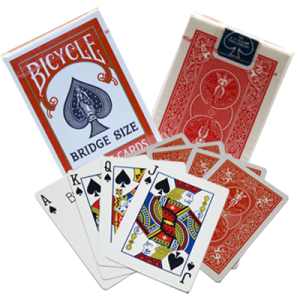 You can also include this in a close-up magic routine if you are performing at a table. I have added some flair to this trick and it works to simply lengthen what is usually a short magic trick. I don’t believe that what I have added confuses or takes away from the original Glass Through Table trick. You can choose what you prefer, the original glass through table trick or my take on it that I have shown you here. You can also make your own version if you feel like adding your own spin to this trick. 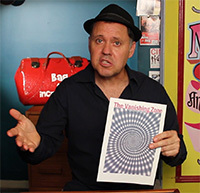 The idea of using the ‘Vanishing Zone’ graphic that I have provided is that it gives you a reason to interact with your audience that they can enjoy for a while before you go into the magic trick. It can also act as an attention deterrent by making the audience focus on the illusion rather than the glass, which is the real secret to the Glass Through Table trick. People will believe that the coin will vanish into the graphic and the centre of the illusion may play a part in that somehow. Is it gimmicked? Has he somehow made a cut in the graphic that we are unable to see? Those are some of the questions your audience is sure to be asking themselves. The coin is the main point of misdirection as I mentioned in the video. Be sure to bring the coin right up to eye level so there is no way they will be able to be looking down to focus on the glass. This is the secret to successfully completing the Glass Through Table trick. The Glass Through Table trick is not meant to be rushed. Time is on your side so be sure to do this slow and purposefully. If you practice a handful of times in front of a mirror while meeting your own gaze, you will see how easy it really is to do this magic move. Did you enjoy this Glass Through Table Trick? To learn more simple magic tricks Click here! Nice and easy. Great trick.